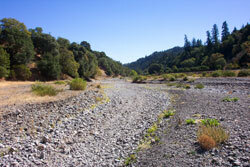 This watershed area is upstream of Warm Springs Dam and drains into Lake Sonoma. This area is largely steep hills and deep canyons. Lake Sonoma and the Warm Springs Dam cut off these creeks from the Russian River, making them inaccessible to steelhead trout. 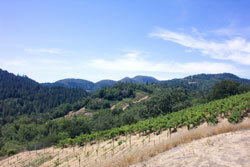 This 1060-acre property has been planted with just over 50 acres of vineyard. 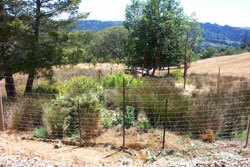 Each vineyard area is separately fenced to allow wildlife free movement from Dry Creek to the mountain ridge top. Along Dry Creek, a drive-across ford was replaced with a railcar bridge and a major revegetation project was installed in 2006 to improve wildlife habitat and water quality.